The Discovery astronauts and their space station counterparts are wrapping up work to unload a newly attached storage module and carrying out maintenance to bypass a short circuit in a U.S. carbon dioxide removal system. Station commander Scott Kelly also plans to install a needed filter to restore an oxygen generator to normal operation. The complexity of the repair work on the carbon dioxide removal assembly, or CDRA, and the oxygen generation assembly, or OGA, prompted NASA to call in additional flight controllers to oversee the procedures and the operation of the lab's life support systems. "Just the mere task of preparing these procedures for execution is pretty involved," said station Flight Director Chris Edelen. "We've had teams of maintenance flight controllers -- they're called the operations support officers, or OSOs -- they're working in concert with the engineering (and safety) experts to develop the procedures to make sure there are no hazards. They're also working closely with our environmental control and life support team. "We'll actually staff extra flight controllers during the day, two extra OSOs, they'll be monitoring CDRA, OGA and the outfitting going on in (the storage module) Leonardo, and we'll have an extra ECLSS (officer) to work the OGA activation while the other ECLSS monitors the normal vehicle functions. So it's a little bit unusual for us, but the pace of work is so high right now we're having to bring in extra personnel." The International Space Station features two U.S. CDRA units, one in the Destiny laboratory and one in the Tranquility module. The Russian segment of the station has its own CO2 scrubber, called Vozdukh, which has been operating intermittently over the past several days. Cabin air moving through the U.S. carbon dioxide removal assembly passes through two beds of zeolite crystals that trap CO2. The beds are then heated to drive off the carbon dioxide, which is dumped overboard. Each zeolite bed is equipped with two heaters, a primary and a backup. The active heater on one of the beds in the CDRA mounted in the Destiny laboratory module shorted out earlier in the week.While the unit remained operational using a backup heater, the loss of redundancy prompted activation of the second CDRA in the Tranquility module. Engineers now want the crew to perform a bit of electrical surgery on the lab unit to prevent any additional problems. "The primary heater had an electrical short and the engineers are concerned that the way that short occurred, that failure could propagate to the secondary string," Edelen said. "So they want us to identify exactly where in the wiring the short took place and then snip the wires so there's no chance of a current getting into that circuit and causing the failure to propagate to the other string of heaters, which would essentially take down the lab CDRA. "So Mike Barratt and Paolo Nespoli will take apart the lab's heater, they'll pull out the bed and they'll use a multimeter, just like you might if you were an electronic enthusiast, they'll use that multimeter to check the pins on the plug and they'll find out where the short is by the resistance in the circuit. Then they'll snip the appropriate wire." While that work is going on, Kelly plans to install a filter in the U.S. oxygen generation assembly to restore that device to normal operation. 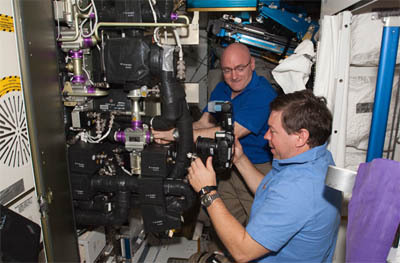 For the past several months, the station crew has been using oxygen brought up aboard visiting Progress supply ships, a European cargo craft and the Russian Elektron oxygen generator while awaiting delivery of the OGA repair equipment.The OGA, like the Elektron, uses electricity to split water molecules into hydrogen and oxygen. "The OGA over the past six months has not been running well because the water that's been fed to it is just slightly too acidic," Edelen said. "We've done some pH tests on the OGA and the engineers have determined that because the pH is not quite balanced right, there was a breakdown in the reaction beds inside the OGA such that material is being released and that material can clog the little holes, the little pores, which can decrease the effectiveness of the OGA at generating (oxygen). "So what we're going to do, Scott Kelly is going to take basically a water filter and it's going to correct the acidity in the OGA and we're going to take some samples to make sure it works good and we're going to run the OGA and generate a little bit of oxygen and confirm that that new filter works correctly. This'll be an important step towards giving us the capability to generate oxygen from the water that we recycle on board." The Discovery astronauts were awakened at 3:24 a.m. Saturday by a recording of Bowling for Soup's "Ohio (Come Back to Texas)" radioed up from mission control. "Good morning, Discovery," called astronaut Michael Massimino in Houston. "That song comes to you from your families, it's for the whole crew. They do want you back here in Texas, we're looking forward to seeing you back on planet Earth when your mission is complete. Good morning." "Good morning, Mike, and thanks to our families, who have really, really supported us from the beginning all the way through this mission," replied shuttle commander Steven Lindsey. "We really appreciate them and really look forward to seeing them again." Discovery's mission was extended two days to give the combined crews more time to unload the Permanent Multipurpose Module that was attached to the station Tuesday. If all goes well, the transfer work will be completed Sunday, hatches will be closed Sunday afternoon and Discovery will undock Monday morning around 7 a.m. Landing back at the Kennedy Space Center is targeted for 11:56 a.m. Wednesday.